North Andover, Massachusetts, Feb. 27, 2019 /PRNewswire/ -- L-com Global Connectivity, a preferred manufacturer of wired and wireless connectivity products, announced today that it has released a new line of moldable M12 connectors designed to address harsh environment networking applications. L-com's rugged, moldable M12 connectors can be directly soldered to a cable and they can be over-molded or heat-shrunk. The connectors are available in male and female styles with 8 Position A-code, 4 Position D-Code and 8 Position X-code keying options. The D-code and X-code connectors are rated for twisted pair or Ethernet applications, while the A-code connectors are designed for straight wire use. All of these new M12 connectors are shielded and are either IP67 or IP68-rated when properly terminated and mated. "Our new moldable M12 connectors were designed to address the need for M12 connectors that can be field terminated in situations where repair or retrofits are required. These rugged connectors are perfect for use in process, manufacturing, oil and gas, and automation industries," said Dustin Guttadauro, Product Manager. 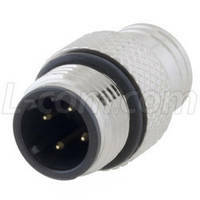 L-com's new moldable M12 connectors are in stock and available for immediate shipment.